Galactagogues are used during lactation to increase the quantity of breastmilk. Common galactogogues include anise, blessed thistle, chasteberry, fennel, fenugreek, hops, marshmallow, milk thistle and nettles. These herbs have been traditionally used by women to increase their milk supply while nursing with varying results. Proper nutrition including adaquate protein, B- vitamins and essential fatty acids are essential to milk production. If you are having problems with supply check your diet first, increase fluids and allow your baby to nurse frequently to stimulate increased production. Has a mild estrogenic effect. Also used to ease colic and gas pains and can be drunk by the nursing mother to relieve colicy babies. Blessed thistle is a bitter herb useful for liver and digestive problems and its ability to increase and enrich the flow of milk. Chaste Berry has a normalizing effect on the progesterone function of the pituitary gland. Vitex stimulates prolactin production and is used by nursing mothers to increase milk suupply. A controlled study found that women who took vitex had an increase in milk production over women who took a placebo. It is not recommended for use after the third month of pregnancy as it may bring on the milk production too early. Like anise, fennel is traditionally used to increase milk supply and also as a carminative to dispell gas. Fennel is a bitter. 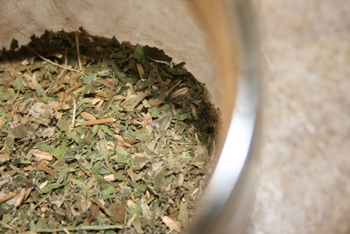 Bitter seeds and herbs are important for stimulating the release of digestive juices. Traditionally very popular. Don't be surprised, fenugreek will make your sweat and urine smell like maple syrup! To use simmer 1 1/2 teaspoons of seed per cup of water for 10 minutes and drink 3 cups a day. Highly estrogenic properties useful for stimulating milk production and regulating hormonal production. Hops are also a sedative useful for insomnia and a digestive bitter. It is best used fresh for its hormonal actions and dried for its sedative actions. Particularly useful when liver imbalances are involved. Nettles is one of our best female tonic herbs! It is an abundant source of trace minerals and vitamins and will help to enrich and promote milk production. One of the best sources for digestible iron. Suggested use is 1 ounce of herb per pint of water and taken 1/2 - 1 cup 3 times a day. To Avoid: Large amounts of sage and parsley may decrease flow of milk. Grind the seeds a bit so that water can come in contact with the inner parts when you brew your tea. To prepare: pour boiling water over the herbs, cover and allow to steep for 10 minutes or more. Usual doseage is about 1 ounce of herb per pint of water. 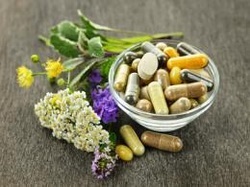 Most of these herbs are bitter and you may want to add a pinch of stevia to sweeten but remember that bitter is good for you. When the bitter principal hits your taste buds it stimulates the release of bile and other digestive juices and this is important for good digestion. Bitters don't work if you don't taste them. Therapeutic Herbalism, David Hoffmann, B. Sc., M.N.I.M.H. Copyright info could not be found in the book.